Over the past few weeks, I’ve had the great pleasure of putting together the May 11, 2014 In Focus for Our Sunday Visitor. It’s on “The Power of Novenas,” and I’m proud to say ūthat some of this blog’s subscribers agreed to interview with me (You know who you are – thank you!). I came across lots of interesting stories and information while working on the project. For example, did you know that the Ancient Romans observed a type of novena? Did you know that Jesus taught us how to pray novenas during his agony in the Garden of Gethsemane? Or that any prayer can be used as a novena when said faithfully nine consecutive times? You’ll find out about these interesting facts in the May 11 issue of OSV. Delving into the topic of novenas, I was reminded of Pope Francis’ special devotion to Our Lady, Undoer of Knots and that made me wonder which, if any, novenas did our two new saints – St. John XXIII and St. John Paul II – pray? Additionally, what’s the origin of those devotions, and how did those popes become devoted to them? So, I went digging, and here are the results. The devotion to Our Lady, Undoer of Knots began in 1612, when a German nobleman, Wolfgang Langenmante and his wife, Sophie were on the brink of divorce. Deparate, Wolfgang sought advice from Father Jakob Rem, a Jesuit priest known for his wisdom and holiness. During their last visit, Wolfgang handed his wedding ribbon to Father Rem, who lifted it up to an image of “Our Lady of the Snows.” As he did this, he untied the knots and prayed, ‘I raise up the bond of marriage, that all knots be loosed and resolved.” (The tradition of the time was for the bride and groom to be “tied” together with ribbon during the wedding ceremony, symbolic of their unbreakable union.) The unknotted ribbon became bright white – a sign of Mary’s intercession – and the Langenmantes’ marriage survived. In 1700, Langenmante, commissioned artist, Jerome Melchior Schmidter to paint an image of Mary that reflected the miracle of his marriage reconciliation. Schmidter, inspired by the words of St. Iranaeus, “By her disobedience, Eve tied the knot of unhappiness for humanity; while, on the contrary, by her obedience, Mary untied it.” Portrayed Mary undoing the knots in the ribbon of our lives and the painting was hung in the church of St. Peter am Perlach in Augsburg, Germany. It’s been venerated there since and reproductions have appeared worldwide. 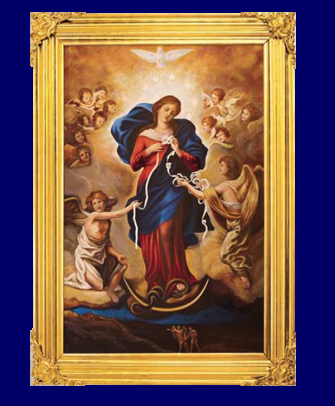 Miracles of various kinds have been attributed to Our Lady, Undoer of Knots. Pope Francis encountered the image while he was stationed in Germany in 1986 styding for his doctorate. He visited the church of St. Peter am Perlach and saw the painting of Our Lady, Undoer of Knots. He was captivated both by the painting and the story behind it. He bought a postcard of the image and took it back with him to Argentina. As a cardinal, he had the image engraved into a chalice and presented it to Pope Benedict XVI. Later in his life, Our Lady, Undoer of Knots saw him through a very difficult time, deepening his devotion to, and appreciation of, Our Lady under that title. Because of this, author Paul Vallely titled his biography of Pope Francis, Undoer of Knots (2013, Bloomsbury Academic). It’s no surprise, then, that the first thing Pope Francis did after being elected was to visit the Basilica of Santa Maria Maggiore and place his papacy under Mary’s care. 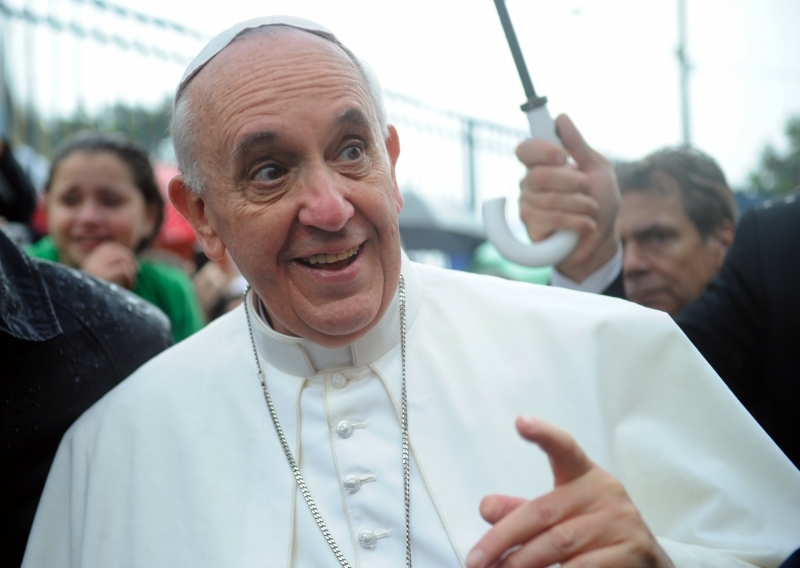 As before his election, he continues to promote devotion to Our Lady, Undoer of Knots as pope. Blessed John XXIII had a special devotion to Our Lady of Confidence, an image of the Blessed Virgin Mary that was painted by the great Italian painter Carlo Maratta (1625-1713). Maratta gave the painting to a young noble woman, who later became the Abbess of the Convent of Poor Clares of St. Francis of Assisi in Todi, Italy. In the painting, Mary is depicted as a northern Italian beauty, with auburn hair, hazel eyes and pale complexion. She holds Jesus in her arms as her great treasure, and Jesus sits in her arms with a regal demeanor. The Abbess, today Blessed Clara Isabel Fornari, experienced ecstacies during which Jesus, Our Lady, St. Catherine of Sienna, and St. Clare of Assisi appeared to her. She bore the stigmata and a mystical crown of thorns that grew through the skin and left her with bleeding, open wounds. On one of his visits, Jesus placed a ring on her finger and declared her his “spouse of sorrow.” She suffered from depression, despair, and was tempted to apostacy and suicide. Blessed Clara Isabel had a great love for the Blessed Virgin Mary and a special attachment to the image of Our Lady of Confidence. Because of this, Our Lady promised Blessed Clara Isabel that anyone who venerated the image would be granted remarkable tenderness and devotion toward herself. When combined with the aspiration, “My Mother, my confidence,” this devotion has proven especially efficacious. Its growing popularity caused the image to be reproduced and the devotion spread. A print was hung in the Major Seminary Chapel (named Our Lady of Confidence in her honor) in the Basilica of St. John Lateran in Rome. It was here that Blessed John XXIII “met” Our Lady of Confidence. During his seminary years, he prayed frequently before Our Lady of Confidence, celebrated his first Mass there, and remained a frequent visitor even after his election to the papacy, saying Mass there and in particular on the feast of Our Lady of Confidence. O Mary Immaculate, he precious name of Mother of Confidence, with which we honor you, fills our hearts to overflowing with the sweetest consolation and moves us to hope for every blessing from you. If such a title has been given to you, it is a sure sign that no one has recourse to you in vain. Accept, therefore, with a mother’s love our devout homage, as we earnestly beseech you to be gracious unto us in our every need. We pray that you will make us live in constant union with you and your divine Son, Jesus. With you as our guide, we are certain that we shall walk in the right way and that it will be our happy lot to hear you say on the last day of our life those words of comfort: “Come then, my good and faithful servant, enter into the joy of the Lord. Amen. Both in his teaching and personal life, Blessed john Paul II was strongly devoted to the message of Divine Mercy. When, on April 30, 2000 he canonized Sr. Mary Fautina Kowalska – the Polish visionary nun who received the message of Divine Mercy directly from Jesus – he surprised the world by establishing the feast of Divine Mercy (also known as Divine Mercy Sunday), to take place on the second Sunday of Easter each year. He declared it to be the happiest day of his life. 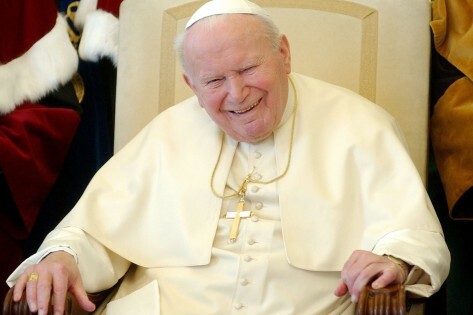 “The Message of Divine Mercy has always been near and dear to me… which I took with me to the See of Peter and which it in a sense forms the image of this Pontificate,” he said. In Blessed John Paul II’s view, Divine Mercy was the message for the Third Millenium and the answer to all of the world’s problems. For that reason, he insisted that the canonization of St. Faustina take place in Rome and not in her native Poland. In that way, he hoped to show the universality of the Divine Mercy message. Two years later, he entrusted the whole world to Divine Mercy at the dedication of the International Shrine of The Divine Mercy in Lagiewniki, a suburb of Krakow in Poland, where St. Faustina’s body is entombed. Jesus appeared to St. Faustina over a number of years, and at the request of her spiritual director, she kept a diary of these visits which amounted to more than 600 pages. As a young man, Blessed John Paul II worked at the Solvay Quarry just a few meters from the Divine Mercy Shrine and convent. St. Faustina was much on his mind when he wrote his encyclical on Divine Mercy, and he often quoted from her diary in his homilies. Through St. Faustina, Jesus gave the world new channels for the outpouring of his grace, including the Image of The Divine Mercy, the Feast of Mercy (Divine Mercy Sunday), the Chaplet, the Novena to The Divine Mercy, and the prayer to be said at 3 o’clock in the afternoon, the Hour of Great Mercy. You expired, Jesus, but the source of life gushed forth for souls, and the ocean of mercy opened up for the whole world. O Fount of Life, unfathomable Divine Mercy, envelop the whole world and empty Yourself out upon us. Amen.